When Dennis Weaver saw the new sign, his heart sank: "Sheep Falls-4 Miles." His favorite picnic spot, one of the most scenic places in eastern Idaho, had been discovered. Would the road be thronged with SUVs? Would the falls be crowded with campers and picnickers? Dennis headed down the little dirt track with trepidation, and came back with this report. A giant boulder we crawled under on hands and knees to get to a ledge that runs along the water's edge. "There will be a ton of people down there." That was our concerned response to the new sign on Cave Falls Road. It pointed down the side road, right to one of our favorite out-of-the-way spots: "Sheep Falls -- 4 miles." One of the most scenic places in eastern Idaho had been discovered. We pictured congestion on the single-track road and four-wheel-drives littered around the edges of the falls. Most people don't even know that there is a southwest entrance to Yellowstone National Park. Because the road dead-ends in the park instead of connecting to the park's arteries, and because the access road, Cave Falls Road, is a long gravel stretch, few people take the drive. The locals go there, though. It has great camping spots and no crowds, so a few families make it a weekend destination. Hikers and horseback riders make it a jumping-off spot for remote trips into the park's backcountry. My 20-year-old son Ben tells of riding a horse deep into the park, how he found a herd of buffalo and rode right through them and how they never became alarmed. This day we had driven up the Cave Falls Road, not to go to the park but to Sheep Falls. 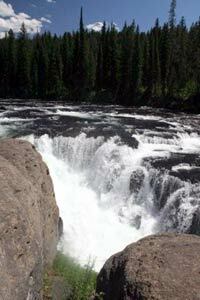 There's a more popular Sheep Falls, the Sheep Falls on Henry's Fork of the Snake River. Ordinarily, the Sheep Falls on the Falls River is seldom visited. But now we were concerned. With a sign pointing the way, anyone could find it. All they had to do was drive to Ashton on State Highway 20, the road leading to West Yellowstone, make a right turn where the sign says "Mesa Scenic Byway," (Idaho State Highway 47) and another right turn on Cave Falls Road, (County road 582). The Sheep Falls sign would tell them where to turn off. The road to Sheep Falls is unimproved. For the first two miles, the road is very good for a dirt road. It might be a one-lane road but it is smooth with few rocks, so even a passenger car can navigate it. Anxious to see who would be there, we drove the good stretch of road at 25 miles per hour. After a mile or so, we crossed a little creek on a quaint bridge and then took the second turnoff to the left. If we were driving cars instead of four-wheel-drive vehicles, we would have parked at this second intersection and walked the last mile and a half. Maybe we would have brought our mountain bikes and peddled to the river. After the turnoff the road gets rough, becoming a rocky track barely wide enough for a pickup. It twists through the rocks and trees, eventually dropping off a lava edge into the river canyon. Merri Ann and I were in a Nissan Xterra and Ben and his wife, Debbie, and their two little girls were in a Toyota FJ Cruiser. As long as we picked our way carefully and took our time, we wouldn't have any trouble. Immediately, the little road skirts a bank of willows. We'll often spot a moose in the willows but not today. Where the road makes a right, it cuts through the willows. Early in the summer, there is enough water in the willows to create a nasty-looking bog hole, but in July, the mudhole is dry, leaving a boneyard of rugged rocks. When water and mud cover the rocks, it's an intimidating hole and people sometimes turn around. They don't need to. With all those rocks in the bottom, they can ease through the mire with no chance of getting stuck. This is volcanic country. Much of Yellowstone National Park and this corner of Idaho is a giant caldera. The rivers, and the little road that we were on, wander across the plateau formed by the caldera. Over time, the rivers cut canyons in the caldera and spill over falls at the caldera's edge. The Falls River is typical. It has cut a remote canyon through the lava rock and spills over several falls on its way to the agricultural lands in the Snake River Valley. The little road crosses the flat, winding through tall pines and dodging giant lava boulders, some the size of a pickup. Where the summer sun breaks through the trees, the ground is covered with mountain sunflowers, splashes of gold against leathery-green leaves. In the cooler shadows are banks of pink, white and lavender flowers. It was easy driving here, just picking through the rocks. Where the road drops into the canyon, as it falls from one lava ledge to the next, it is rougher. We locked our drivetrains into four-wheel drive and shifted down to low range. We knew we wouldn't get stuck, but it was a slow creep down through the rocks and the higher clearance of the SUVs was necessary. Once, where dirt collected in the ruts, we stopped the car and got out to look for fresh animal tracks. This is wildlife country but it was too hot and most of the animals were hidden in the shade, deep in the pines where the air was cooler. Wolves and bears keep the game populations down. Still, we watched for elk and deer. We talked about how, earlier in the summer, we had watched a cougar chase a deer across a little dirt road like this. The cougar knew that the deer would not run straight for long and cut to the right to intercept the deer if it turned that direction. Instead, the deer turned left and escaped.